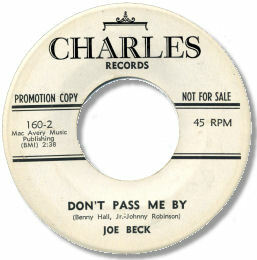 Not to be confused with the great jazz guitarist, this Joe Beck cut 4 singles for the New York Charles concern, I guess, in the mid/late 60s. All are well worth the time and trouble of finding - if you can! Most of his output was strongly R & B flavoured like “Blow My Cool” with it’s punchy horns and funky feel, and Do You Really Love Me Baby an excellent stop time song with some super horn charts. The ice-cold blues shuffle “Daddy Cool” – the song which gave him his nickname - with Beck’s almost spoken boasting has a certain edge to it as well. 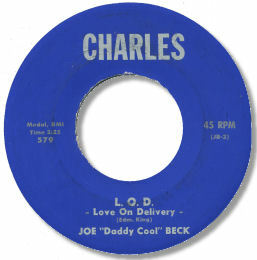 LOD Love On Delivery a very good ballad, with some fine churchified organ and piano may well be the pick of the numbered sequence of Charles 45s, but the killer track though is the magnificent deep Don’t Pass Me By. Set in 6/8 time in the grand manner, Joe really cuts loose over a horn rich backing which also features some fine girl group vocals. In contradiction to the title of his best song, Beck seems to have vanished without trace – and I’ve never read anything about the man either. His voice and songwriting abilities deserve far greater recognition.